Published on February 14, 2018. It's Valentine's Day and love is in the air. 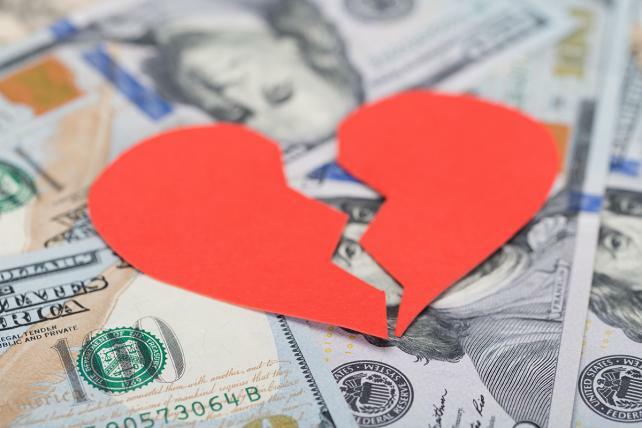 Except at several companies that decided to pull the trigger on layoffs this week, including Barnes & Noble, Turner, Amazon, Hearst, Rackspace and PepsiCo, which announced bonuses—and job cuts—on the same day. More on PepsiCo below. But first, we start on a more lighthearted note, with how fast food chains are spreading the love today. Nothing says Valentine's Day like … fast food? While fast food might not be your first thought for a hot date, thousands of people annually reserve tables at White Castle on Feb. 14 for romantic meals of sliders. And this year, other chains are making their own Valentine's Day declarations. KFC has scratch 'n' sniff valentines featuring sayings such as "You have the secret recipe to my heart" that give off the romantic aroma of fried chicken. And Chipotle is my life. 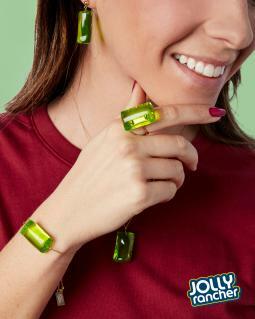 For those who still need gifts, there's a Jolly Rancher jewelry collection of what the "Keep on Sucking" brand is calling sucky, sparkly, Valentine's jewelry made with sterling silver, 14k gold and "candy-like gems from the rarest plastic on earth." McDonald's, meanwhile, is promoting a custom ring featuring diamonds and gems meant to look like a Big Mac. The Nadine Ghosn-designed ring, worth $12,500, is set to go to a fan who professes love for the Big Mac on Twitter in its "Bling Mac" contest. It's all part of the Big Mac's big 50th anniversary celebration this year. Other elements include "Big Mac Hero," an online retro-style video game that plays in similar fashion to "Super Mario Run." McDonald's developed the game in partnership with Reddit and Snapchat, which are also both promoting it through their channels. And there's a Snapchat Lens that can turn one's face into an 8-bit character much like those of the two characters in the game, Max and May. On an earnings call Tuesday, PepsiCo CEO Indra Nooyi cited the recent federal tax cut as allowing the food and beverage giant to pay bonuses of up to $1,000 for an unspecified number of workers in the U.S. What she failed to mention is that the company was also laying people off. The job cuts were later confirmed by the company, which stated that it is laying off "less than 1% of our U.S. workforce focused on corporate positions" as part of a "continuation of the 5-year, $5 billion productivity program we publicly announced in 2014." As of Dec. 30, PepsiCo employed 263,000 people worldwide, including 113,000 people in the U.S., according to financial filings. A spokesman declined to comment on how many, if any, marketing positions are included in the cuts. The layoffs come as the marketer's North American beverage business continues to struggle. 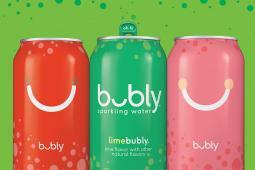 PepsiCo is counting on its new sparkling water brand, Bubly, to help reverse those trends. But on the earnings call Nooyi conceded that PepsiCo was late to the sparkling water craze. "I wish we had launched Bubly a couple of years ago," she said, but added that "we are feeling good about Bubly." For PepsiCo's sake, it better not go flat. An Illinois man filed a federal lawsuit this week after outdoor retailer LLBean cut its generous return policy from unlimited to "one year with proof of purchase." The change, which happened last week, was the result of a "a small, but growing number of customers" who had been interpreting LLBean's "guarantee well beyond its original intent," said Shawn Gorman, executive chairman at LLBean. The lawsuit argues that LLBean was "deceptive and unfair of its promises," adding that customers should still have an unlimited return window for any purchases made before Feb. 9, 2018, or when the new return policy took effect. The six-count lawsuit seeks unspecified damages and class action status. Planet Fitness piqued the ire of the U.S. Olympics Committee when it recently aired a spot in which it referred to gym goers in Olympia, Washington, as "Olympians." After receiving a "cease and desist" letter, the fitness chain is back with a purple-hued commercial that refers to the Washington residents as anything but... the one word they're not supposed to use. A glasses-wearing, pencil-pushing enforcer hovers nearby to double-check language. Planet Fitness worked with Hill Holliday on the minute-long rebuttal. If you thought Eagles fans were ready to celebrate (or prepared to drown their sorrows, which didn't happen) on Super Bowl Sunday, now there's alcohol sales data to back up that theory. In Philadelphia during the week of the Super Bowl, sales of sparkling wine soared 219 percent from a year earlier, according to Catalina. Sales of pre-mixed cocktails in the City of Brotherly Love shot up 213 percent and sales of malt beverages (like beer) rose 64 percent. But fans in Boston generally weren't buying much more alcohol: Sparkling wine sales were down 12 percent in Boston versus an average week, but rose 45 percent in Philly. Both cities saw larger increases versus the overall country in certain party food categories. Take cocktail franks as an example: National sales of refrigerated and frozen franks rose 292 percent in the week ended Feb. 4 versus the average weekly sales in the latest 52 weeks. Cocktail frank sales soared 497 percent in Philly and 468 percent in Boston during that week. Catalina collects aggregated and individual shopper ID data from thousands of grocery, drug, and mass merchant stores. Under a new partnership, J. Crew is teaming up with office-sharing company WeWork. The struggling apparel company is tapping WeWork members as models for its spring 2018 campaign, continuing a recent strategy of crowdsourcing its marketing in #CastMeJCrew. The results will be unveiled in a digital catalog. Meanwhile, some WeWork offices will host J. Crew pop-up shops, and the companies will together hold panels about success and personal fulfillment. Remember the beauty box craze of a few years back? You may be among a vanishing breed. A new study of emerging, or formerly emerging, beauty retail channels by 1010data using credit and debit-card data of more than a million consumers finds Birchbox's 2017 sales down 21 percent from 2016. But Ulta and Sephora continue to grow explosively, particularly online, according to 1010data. Ulta's online sales have nearly tripled since the first quarter of 2016, while Sephora's online sales have more than doubled since then. Their in-store sales aren't bad either, with Ulta's up 48 percent and Sephora's up 38% since the first quarter of 2016. Fitness beer is officially a thing, with more brands starting to chase the success Anheuser-Busch InBev has had with its low-cal Mich Ultra brew. Heineken USA just launched a campaign for its new Amstel Xlight, currently available only in Texas, Arizona and Massachusetts. 647,288: The number of U.S. restaurants, down 2 percent from a year earlier, according to NPD Group's Fall 2017 ReCount. The number of chain locations rose but the number of independent restaurants declined. The Grocery Manufacturers Association says president and CEO Pamela Bailey plans to retire in 2018 after nearly 10 years at the helm. GMA, which has seen the likes of Campbell Soup and Nestle leave the trade group in recent months, says Leslie Hortum of Spencer Stuart has been retained to lead the search for Bailey's successor. "As GMA's Board continues to engage in the reinvention process to build the association of the future to meet the consumer needs of the future, it is best that they do so in concert with their leader of the future," Bailey said in a statement.